Analysis of existing iron inoculation methods to obtain spheroidal shape of graphite is presented. It is shown that for iron inoculation with Mg-containing inoculants with a high coefficient of magnesium assimilation and a minimal pyroeffect it is necessary for magnesium vaporization rate to be equal to the rate of its interaction with iron components, at the same time the inoculant should not surface in iron, but should remain at the bottom until completion of reaction. Said conditions are easily met by using a fine-dispersed mixed inoculant. Key words: Iron, inoculation methods, inoculant, properties, magnesium, assimilation, dispersibility, vaporization. There is created an essentially new technology of producing hypereutectoid steel with spheroidal graphite inclusions by using highly effective inoculation in precrystallization period, combined with optimization of castings’ chemical composition and their cooling rate. Key words: Hypereutectoid steel, spheroidal graphite, inoculation, microstructure, heat treatment. The article presents a new program module CastDesigner intended for designing easily feedable steel castings made in sand molds. Castings’ adaptability to streamlined production is ensured already on the stage of cast part design due to interactive change of casting geometry to control its feeding from risers. The basis of mathematical models (MM) included inCastDesigner program module is a systems engineering approach developed at N.E. Bauman MGTU. The CastDesigner program module has been developed by the firm CastAssistent 3PCAST (Germany) together with Foundry Technology Chair of N.E. Bauman MGTU (Russia) under participation of the Technical University “Mining Academy Freiberg” (Germany). Key words: Castings’ adaptability to streamlined production, risers, steel castings, cast part design, program module. Examples of implementing of method investment casting in the form ofliquid glass mix with liquid hardener. Key words: Investment casting, liquid glass mix with liquid hardener, ways of compaction, the combined pattern equipment. Issues of studying the mold fillability in casting with crystallization under pressure at piston pressing scheme, including process simulation elements, are discussed. Key words: Fillability, pressing, die, sample casting, plug, die block, melt, simulation. Examined are different molding sands for expanded pattern casting (EPC) technology. Effect of sand properties on casting quality is shown. It is concluded that molding material may play a crucial role in producing a quality casting, and when choosing a sand all its characteristics are to be observed: grain shape and size (fraction), mass fraction of clay component, and moisture content, neglecting even one of them may lead to unwanted results. Key words: Foam polystyrene, EPC, pattern, sand, gas permeability, grain, burning-on. The source of blowhole formation in a steel railroad car casting made by V-process was determined. Presence of a found chemical element in molding materials used was checked. Comparative testing of basic molding materials from two Russian market suppliers showed an excess of a gas-forming element. Necessity of organizing an incoming inspection of materials, even from the most reliable suppliers, is shown. Two known domestic quick tests are proposed. 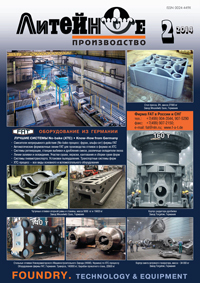 Key words: V-process, blowholes, railroad car castings, molding materials.